Whether you are a green flash spotter, surfer, sunbather, volleyball player, bodyboarder, or if you want to take your four legged friend who’s ready for a walk; follow our guide to find the best spots in North County San Diego. Its name lends a clue to the vast variety of functions this location offers. A large open grass area invites a picnic and tan top up, adjacent to it the littles can play at the huge playground. The equally spacious beach attracts surfers, beach joggers, a lazy stroll, and those just wanting a dip. Bring a nice change of clothes for a posh beachfront meal or drinks at Jake’s or Poseidon. Don’t forget to keep an eye on the schedule for art and music events! A picturesque location with a knoll filled with flowers, this spot draws a crowd near and far. The compacted sand make it a runners favorite, it’s close to downtown Del Mar, is kept clean, and has a great surfing zone. Don’t worry about a high tide making it hard to sit and watch the sunset; enjoy one of the many benches and take in the beautiful view. One of the few dog beaches in north county does not disappoint. Street parking is usually plentiful, just be very aware of the time left as meter maids frequently check. As you walk up there are drinking fountains for you and your four legged sidekicks, portable toilets, and plenty of dog waste bag stations. Also known for one of the hottest beach volleyball locations in the area with multiple courts. Look for two parking lot signs at the corner of Sierra and Del Mar Shores Terrace. Located next to the DMST Condos you will find a very steep staircase leading you to a stretch of sand with the feel of a private beach. At low tides, you will discover tide pools to investigate and enjoy. There are no facilities or regular lifeguard services. Great for swimming, snorkeling, surfing and body boarding. A true North County gem; this spot has a great playground for the littles, half a basketball court, a large grassy area to picnic, tables that overlook the beach, facilities, its own lot and street parking, and a long wide ramp down to the beach where surfers enjoy long rides down endless pipes. It got the name “Pillbox” because of its history as a WWII Gunnery installation. Walking distance to the train station, shops, and great local eateries. Lifeguards are on duty year-round at Fletcher Cove, from 8 am. to 6 pm during the winter months, and from 8 am to 8 pm during the summer months. 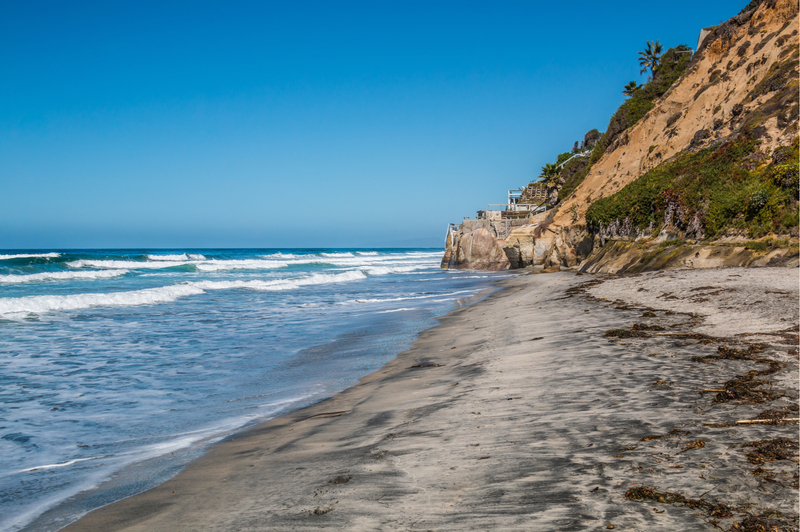 On the border between Solana Beach and Cardiff at the south end of Cardiff State Beach, you will be happy to stumble across a long sandy strip along the San Elijo Lagoon. This large state park and wetland and ecological reserve allow for tide pool exploring, swimming, snorkeling, and the surfers enjoy the break over the reef. When the tide allows you can walk south to Tide Park. Famous for its two reefs that create awesome breaks for surfing, this laid-back spot has it all. Across the street from a few tasty eateries as well as home to dining on the sand at Pacific Coast Grill and The Chart House. Amenities include restrooms and showers, there is a fee for parking unless you find a spot along the highway, and you can bring your pooch as long as you keep the leash on. An underwater reef produces barreling waves attracting surfers far and wide. This famous beach hosts surfing competitions drawing local favorites and visiting masters. It’s a quaint spot on the south end of the campground where the cliffs end. The main attraction in Cardiff; this mega long beach has a campground, day use parking and several long stairways and ramps that lead down to the narrow sandy beach. Full facilities, a great splash area for the kids, and all the beach activities you would expect with this hot spot. The store is open March through October offering rentals, food and sunscreen. This high demand surf spot is sacred to locals and can get busy but you’ll always find a pocket to catch a wave. Soft sand perfect for castle building, you can enjoy all of the staple beach activities as well. Park in the spaces to the west side of 101 or along the dirt road to the east of it and the beach is about a hundred feet down the steep paved main entry. Or alternatively, access from San Elijo campgrounds. Restrooms and showers are at the top of the hill. Exit Encinitas Boulevard and you dead end into THE hot spot of North County. One of the only spots with fire pits, you’ll find this beach poppin’ sunrise to well past sunset year round. A multi-age playground with adjoining grassy area, beach volleyball, well-kept facilities, a concession stand, rental facilities, free parking, soft sand; this place truly has it all. Voted one of the most family-friendly of all, the water is gentle and the sand is clean. Check the summer camp schedule that this beach hosts a variety of surf and junior lifeguard programs. Due to its popularity, a brand new lifeguard tower has just been built and is open all year. Hours are 5 am to 10 pm. *There is an area that has run off and it’s clearly marked, please keep the littles away it’s not a splash pool. One block south of Moonlight you’ll find access at the west end of D street. The viewpoint looks out upon surfers riding long rolling waves. Down the wooden staircase, you’ll come to the beach with a nice gradual slope ideal for playing and enjoying shallow waves. Free street parking and a lifeguard, this is a simple spot to escape the crowd at Moonlight. A famous surfing spot, there’s lots of parking and the beach isn’t too crowded. The park above offers a great spot to watch the surfers, enjoy a picnic or catch the acro yogis practicing on a weekend. A short walk up the 101 and you’ll find Swami’s café and the famous Meditation Gardens. No lifeguard on duty. The long wooden stairway at the north end of Leucadia State Beach leads you down to the narrow beach below high bluffs. Surfers enjoy the little trek to this secluded spot, there are no facilities but a half mile journey to South Ponto Beach provides them. The main beach in Leucadia, sandwiched between Grandview and Stone Steps is tucked below the bluffs reachable by a narrow trail that has three switchbacks to descend. Luckily there is a small lot on Neptune between Jasper and West Leucadia Blvd. This beach is perfect for a sunset stroll, surfing, sunbathing and jogging. Aptly named after the large concrete and stone stairway that descends the steep bluff leading to a narrow beach below. This locals beach has a great reef providing surfers consistent action, and compact sand, perfect for walkers and joggers. Keep an eye on the tide as it has been known to cover the entire beach. No facilities near and street parking only. The bordering connection of Encinitas and Carlsbad, this wide open beach area draws in quite the crowd. Surfers, swimmers, and sunbathers appreciate the ocean overlook and walking paths in addition to the surf and the sunshine. Lifeguards, facilities, and a paid parking lot. A nice little trail down the bluffs with soft sand leads the way to the beach which is a bit on the narrow side in comparison to South Ponto, but enjoyable nonetheless. Can be known to have stones after a storm so be prepared to create your sunbathing spot for maximum relaxation time. Free parking lot, lifeguard, and facilities. Along with a beautiful stretch of the coast, this wide beach has just finished a makeover kudos to the city for restoring the native vegetation along the banks. Great for paddle boarding, sunbathing, swimming and building sand castles with the family. Facilities, paid lot and street parking. Long and narrow sandy stretch sandwiched between the surf and piled up rocks to protect the homes from the eroding sand. A great and simple spot for a jog or leisurely beach walk, no facilities and street parking. Family friendly spot: snack shack, beach rentals, kids playground, basketball court, grass park, clean facilities and a well-kept soft sand beach. Surfing allowed in designated zones and a lifeguard on duty. They throw in free parking to sweeten the deal, too. This wide and long beach provide lots of room to spread out and enjoy an afternoon of beach fun. The pier is a fun walk and includes restaurants and fishing supplies. A play area for the littles, as well as volleyball courts, a lifeguard, and facilities. A quick walk into town for the weekly farmers market or additional eateries. Boxed in by two rock jetties you’ll find a rare spot that includes kite surfers and windsurfers. Also great for sunbathing, fishing and swimming, of course. They pull out all the stops by including BBQs, fire pits, picnic tables, full facilities, a snack bar, RV parking and a kids play area. Do you know of any missing beaches that should be included in this guide? Contact us here or comment below.